gastronommy.com: Should the white man be cooking the yellow man's food? Should the white man be cooking the yellow man's food? 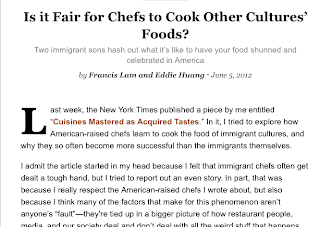 Is it fair if chefs become famous over cooking another culture's cuisine? subject: A question of culinary morality(?) for you. He wrote: I went to Pok Pok NY this weekend and it was tasty as hell. It was an "authentic" Thai restaurant opened by a white dude from Oregon. I learned the background from the NYT article below, but I confess to sharing the sentiment of Mr Baohaus in the back of my head (next article). What do you think when it comes to what is "right"? Eddie makes some good points that I can definitely relate to, especially the growing up as an Asian in America part. Kids would make fun of my school lunch if it ever involved noodles or rice. I was teased for simply being Chinese. Yet, I'm mostly hearing 'wah wah wah AZNPRYDE wah wah wah'. So what if some white man becomes popular over the dishes that we were once teased for? I think it's a good sign that we're finally over that racist hurdle to the point where even other nationalities want to master our cuisine, instead of only French/Italian/Spanish being the standard. Have you been to the Chinese restaurants in Italy? Hell, even the Chinese themselves in Italy don't respect their own cuisine - clearly the Italians as a whole haven't really gotten into Chinese food yet as Americans are beginning to. 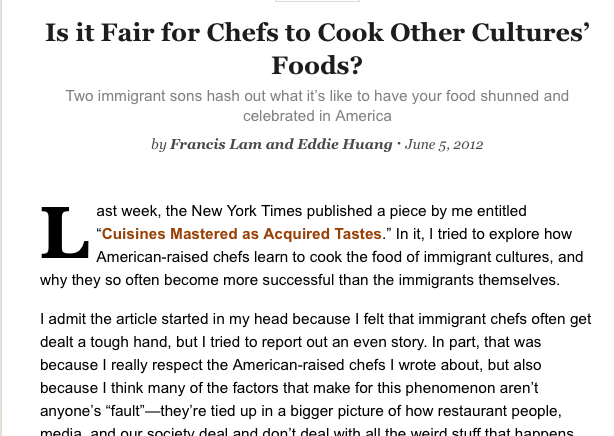 If anything, I'm tired of Asians going to culinary school to hail French or Italian as the true culinary pillar. In Bangkok, Nahm is one of my favorite Thai restaurants in that city and it's helmed by Chef Thompson (who spent countless years in Thailand learning the craft). Some of the best French bread I've ever had was and is still made by Robuchon's pastry chef, a young Japanese guy now based in Singapore. In fact, if I decided I wanted to open an Italian restaurant in America, doubtless I would be annoyed if all these white people brushed it off because of my heritage. Eddie says that all we ABCs have left as part of our identity in America is our food, but I think the same goes for any race in the USA. And that mix and availability of cuisines is part of the beauty of it all - especially in New York City. Momofuku serving a mishmash of Korean, Japanese, Taiwanese or Chinese food doesn't take away from the Asian identity (and yes Eddie, your pork buns are totally better than David Chang's). Here, Singapore is a melting pot of cultures as well. While prata is Indian, teochew porridge is Chinese and nasi lemak is Malay, everything still falls proudly under the Singapore umbrella with nothing taken away from an Indian, Chinese or Malay person's cultural identity. For his point about restaurants like Empellon (NYC) winning James Beard awards and none of the carts in Red Hook Ballpark - I don't think that's a question of cultures and races, but another question all together. You just don't compare street carts to full on restaurants; neither is superior, because neither is the same. Going back to my statement about Nahm in Bangkok, while it is one of my favorite restaurants, my favorite thing to eat are from the street carts down the road from my grandparents' place south of the river. I would never expect them to appear on a James Beard award equivalent in Bangkok though. The best part about a chef cooking another culture's cuisine is that it opens doors for questions. People start getting curious about what is truly authentic or not and research it out themselves. Discussions happen. For example, overtime people who know of Momofuku now know that their ramen is Japanese and their kimchi is Korean... and that you can probably get better kimchi at some dingy place in Queens even if Chang is Korean by blood. I mean, you have people like me, an ABC rolling my eyes at French bistros who claim authenticity if they serve something not prepared classically. It would be amazing to see the day come where people do the same for Thai, Taiwanese, Cantonese, Mexican, Persian... or whatever it may be. Even if Pok Pok NY isn't THE best Thai in New York, it's a step in the right direction. This is the generation of foodies, and people will make the effort to dig deeper and always demand for better. The gwailo-American attention is a good thing. I think Eddie (and thousands of other ABCs) needs to get over his Asian complex. You don't need to be white to be American. I used to think like that too, but things aren't the same way they used to be as when we were kids -- least of all, a place like New York. And cuisine-wise, we are evolving in a good way. There are a hundred more things I'd like to address, but as Francis Lam said, it's a HUGE topic. great read Victoria! it really does raise a lot of questions and it makes people curious and want to find out more. Nice post.....very interesting & informative!! Well in juxtapose, other races have been trying to cook the white man's food for ages and while some have succeeded, many others have failed, due to mainly a lack of a deeper understanding of the dish and its roots and the culture of whichever race made it. Then there are those came out with an interesting twist or an abomination more often, cos they were limited by the availability of produce and ingredients or just simply because they were feeling creative. The funny thing is in some dishes somehow taste better displaced in another location whoever cooks it. I still strongly feel that the best kinda food is produce-driven. Pho from Hanoi beats anywhere else's hands down, but in NY or Melbourne, they come really close cos of the quality of the beef. Roast Duck Rice according to some are the best in london. Somehow the english duck has the right amount of meat fat ratio. Whoever wants to cook whatever dish, let him/her cook it, food's meant to be shared across the table. A global table, in this context. That's how new dishes came about anyway. A plus point if they do justice to the dish. That saying, I'd wait for the day to patronise an ang mor hawker for that decent plate of black-enough char kway teow, with the right amount of lam cheong, the right kind too, and hum.